Employees can sign in and request Time Off (if you allow them on your SETTINGS>Global Employee Permissions page). The Time Off Request is then sent to the manager to be approved or rejected. On your SETTINGS>Employee Permissions page, you can also change this option to allow employees to enter their own, already approved Time Off. 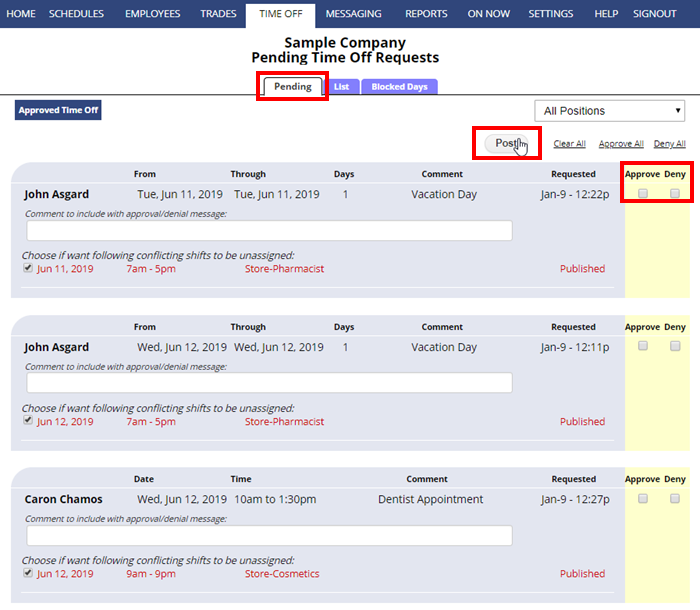 The manager can be notified by email of the pending request and sees the alert “X Pending Time Off requests” in their “What’s New” section on the home page or at the top of most other pages. Clicking that link takes you to the Pending Time Off page where you can see the days and times that they are requesting off and a list of any conflicting shifts. The Time Off will be added and any conflicting or overlapping shifts will be set to unassigned. A message will be sent to the employee informing them of your decision along with any comment you added if they have chosen that notification option. Note: Employees can sign in and cancel a Time Off request at any time before you have rejected or approved it, but once it has been approved or rejected, only a manager can delete the time off.